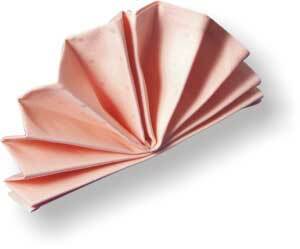 Zemmrate » Table setting » Napkin Folding - Mitra bishop. 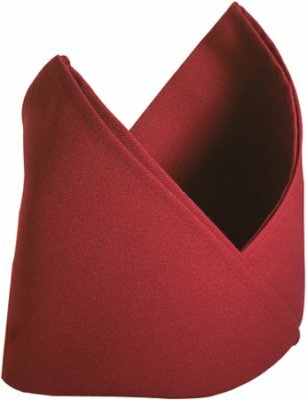 Napkin Folding - Mitra bishop. 1. Fold the napkin in half get a rectangle. 2. Then folded the opposite corners of the rectangle and get trapezoid. If you use a paper towel but it is easy when you use the rag better at hand to keep the steam generator, otherwise everything will be straightened right in your hands. 3. Turn the napkin and fold it in half along the length of the trapezoid so that one side was level ground and the other outlines triangles peaks "as the mountains." 4. Angle that faces you bend down , although this can not make the specified drawing given to you to understand what the other corner you have to fold in half inside the mountain top. Similar manipulations were carried out and the other vertex from the other side. 5. These flaps wrap or as convenient to express invest in the nearby base caps. 6. Insert your finger into the base of the resulting myrtles and straighten it slightly as not to destroy the design of the cloth. 7. Put on a plate resulting myrtle. Continuing the theme of etiquette can not but affect the important details table decoration: napkins, tablecloths, flowers. More details on this subject can be found in the article "how to fold napkins?"